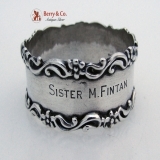 American sterling silver baroque scroll and rose border napkin ring inscriber Sister M. Fintan by the National Silver Company, c.1900. This elegant napkin ring is 1 7/8" in diameter, 7/8" tall and weighs 24 grams. Inscribed as described above, the soft, warm, original finish is present, with no buffing or machine polishing. The excellent original condition and clear detail, with no removals, repairs or alterations, make this an especially attractive offering. 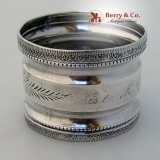 American sterling silver napkin ring in an Aesthetic engraved design on a double waisted body with Palmette borders and milled edges, inscribed: Sister M. Cyril, c.1885, marked 925 Sterling 1000 pattern 179. This interesting napkin ring is 1 3/4" in diameter, 1 1/2" tall and weighs 16 grams. Inscribed as described above, the soft, warm, original finish is present, with no buffing or machine polishing. The excellent original condition and clear detail, with no removals, repairs or alterations, make this an especially attractive offering. 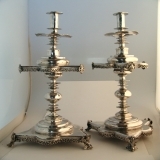 Sterling silver lidded kiddush cup and cover with repousse grape motif and handsome finial. 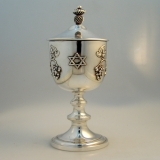 This is a marvelous piece of sterling Judaica was made c. 1950 It measures 8" in height, with a diameter of 2 3/4" and weighs a substantial 169 grams or 5.43 Troy ounces. The impressive original condition and crisp detail, with no monograms, removals, repairs or alterations, make this an especially attractive offering. The soft, warm, original finish is present, with no buffing or machine polishing.